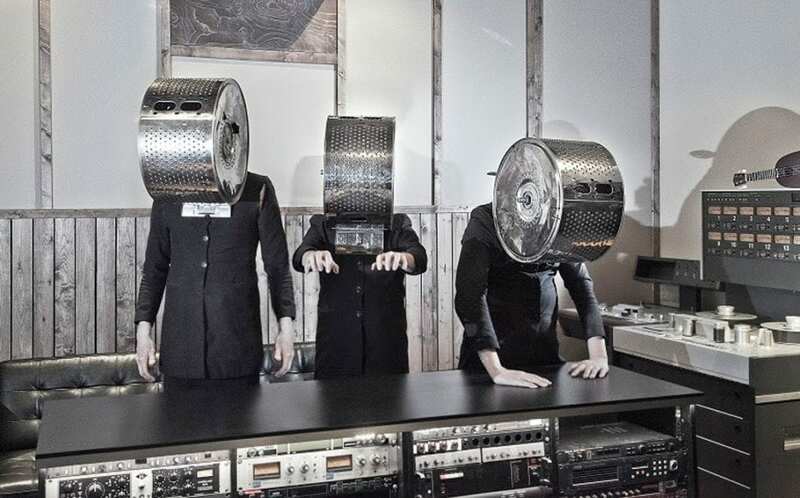 (Photo by Klaus Welp) The Finnish trio cleaning robots return with their first album in ten years on Svart Records on February 15th: “Intersubjectivity”. The album has been mixed by Einstürzende Neubauten’s Alexander Hacke. The band recorded the album in the brand new E-Studio in Sipoo, Finland, with as few overdubs as possible. The studio sessions took a mere five days, as did the mixing. Here’s a photo of the list of instruments they have used. After the previous album “U” the band have spent their time with a number of multidisciplinary projects, including music for documentaries and movies and live soundtracks to silent movies, and also played over 500 shows in over 20 countries. The band also took part in, among others, the Parallax art exhibition in Mexico City, which showcased Finnish modern art. Cleaning Women was founded in 1996. The band plays melodic rhythm music with electronically reinforced household utensils such as clothes racks, washing machine trolley wheels etc.. In addition to music, the band has become known for their gigs where they have played their special instruments dressed in black jackets, boots and tights.